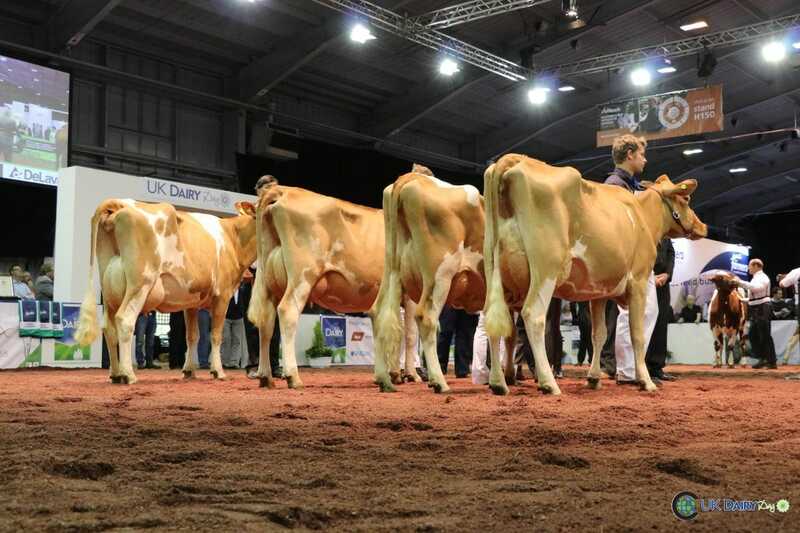 There were 8 Cattle forward from 4 exhibitors at this year’s UK Dairy Day at Telford. Judging was Mr James Warren and he found his Champion in second calver, Kimcote Legend Fragrant 4 from the Thomas Family. In Reserve was her herdmate, Kimcote Legend Angel 3. Hon Mention went to Bourton Clover 53 from Michael Dawes. Here is James’ report with full results. 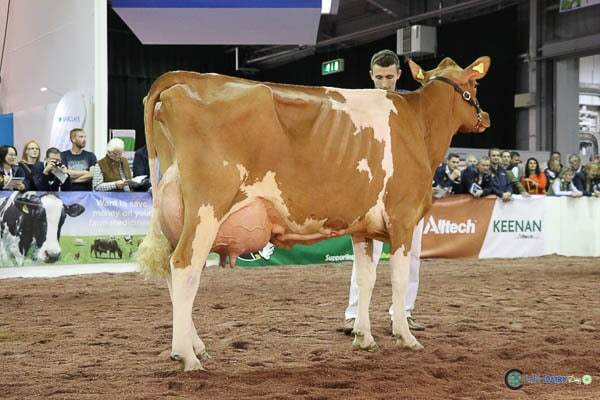 My first class had four in milk heifers forward and I had a very correct heifer in first place, although not the biggest, she was very well balanced with a lovely udder and it was this levelness through her udder and rump structure that put her over my second placed Heifer. The second and third placed Heifers were much closer, but I felt the Heifer in second had more cover in her front teat placement. My third placed heifer had the advantage over the fourth placed heifer with having more bloom in the udder as the fourth placed heifer had calved 10 months. Bourton Clover 53 (VIP) Michael Dawes. Edgehill Gotcha Violet. Michael Dawes. Kimcote Conquest Valerie. Thomas Family. Hinton Clarity. (Jupiter) . Hinton Farm. 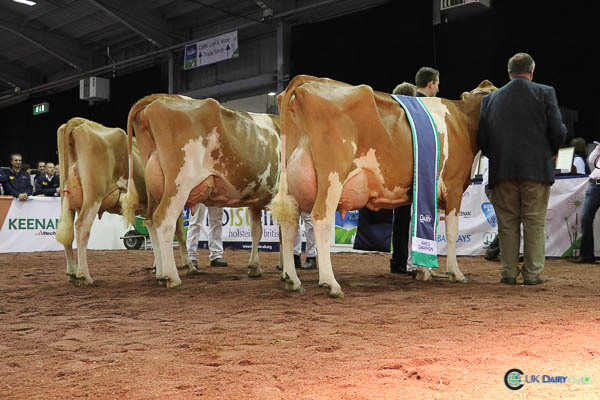 The second class saw three junior cows forward and in first place I had a tremendous dairy cow who was exceptionally clean and sharp over the shoulder and showed these Dairy qualities right down to the tip of her tail. She had a full udder of milk and it was this that gave her the advantage over my second cow who had calved back in early spring. Not to take anything away from my second placed cow who had the same stamp as the cow in first and it was the Dairyness that she showed that placed her over the third placed cow. Kimcote Legend Fragrant 4. Thomas Family. Kimcote Legend Angel 3. Thomas Family. Beeechgroves Cleopatra 3. (Novak) DR Gribble. The third class had one senior cow forward who had tremendous strength and power and width through the rump and also a very strong ligament in her rear udder. Beechgroves Elinor 20. (Laredo). DR Gribble. 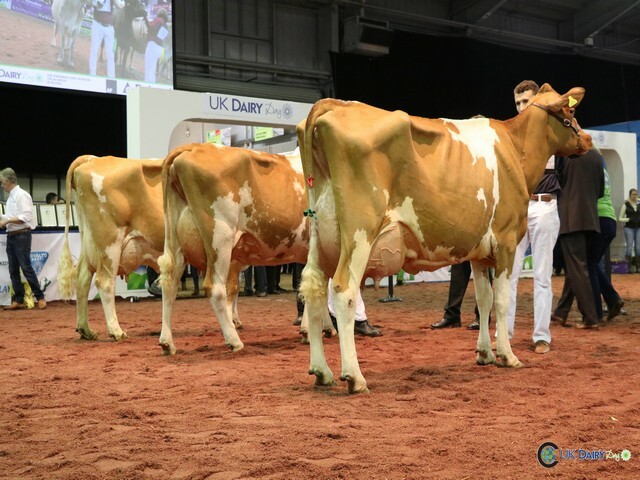 I had no hesitation in making my Junior Cow Champion as I loved the Dairy qualities she possessed with Reserve going to the second placed Junior cow and these two went forward to represent the Breed in the the Interbreed Pairs. For my Hon Mention I went with the in milk heifer as I think she has a great future. I would like to thank the UK Dairy Day for inviting me to judge and to the Exhibitors for bringing their cattle to the show.